Unlike many career paths, cooking and baking require hands-on experience learning proper techniques and presentation. With a maximum of eight to ten students in the professional series under the guidance of an instructor and one to two teaching assistants, ACE offers personal attention unlike any other cooking school. In addition, students may call, email, text Chef Cecilia and her staff with questions and receive immediate feedback. Because of its size and intimate learning environment, Chef De Castro devotes significant one on one time with each student to achieve their goals, including, actively seeking employment opportunities for each of them with colleagues and alumni during and after completion of the programs. More Affordable Than Most Other Culinary Programs: Great Value! Culinary schools can cost up to $75,000 over several years. Culinary students usually devote full-time learning by lecture, demonstration and tests, with limited hands-on practical on the job experience. ACE strives to provide a cost-effective practical education that will allow its graduates to hit the pavement running by placing its graduates with alumni in the most sought after positions in the industry. 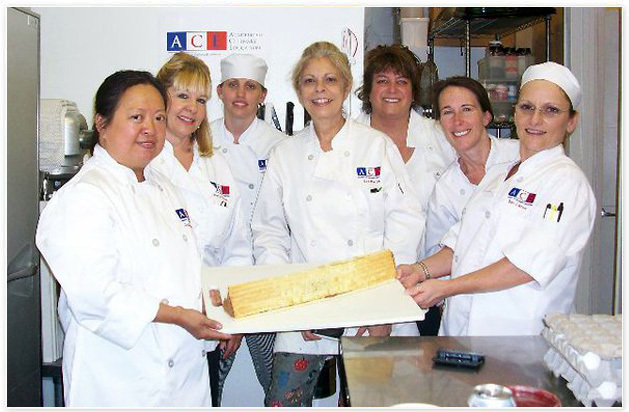 ACE is proud to share in the success of ACE's alumni in restaurants, catering, writing, television etc. Click here to view our alumni. Chef Cecilia describes herself as everyone's mother at ACE. In addition to her distinguished professional expertise, she devotes countless hours outside the kitchen to her ACE family. Like your own mother, Chef Cecilia provides honest feedback, advice and encourages her students to achieve their untapped potential. Even if members of the "family" graduate, alumni freely drop into ACE's kitchens to teach, volunteer, seek advice and/or enjoy camaraderie with ACE students. Click below to sign up for any of our programs.